I’d like to take a bit to share some thoughts on time. This isn’t a strong opinion, but I lean in favor of a view where time doesn’t exist as a thing in and of itself. Instead, maybe “we” bring it into existence as our consciousness navigates this eternal unity, which is the universe. In reality, there is just an eternal now. I’d like to a take few quotations from Erwin Schrodinger. It is not possible that this unity of knowledge, feeling and choice which you call your own should have sprung into being from nothingness at a given moment not so long ago; rather this knowledge, feeling, and choice are essentially eternal and unchangeable and numerically one in all men, nay in all sensitive beings. But not in this sense — that you are a part, a piece, of an eternal, infinite being, an aspect or modification of it… For we should then have the same baffling question: which part, which aspect are you? what, objectively, differentiates it from the others? Thus you can throw yourself flat on the ground, stretched out upon Mother Earth, with certain conviction that you are one with her and she with you … For eternally and always there is only now, one and the same now; the present is the only thing that has no end. Schrodinger strongly felt we are beings beyond space and time, a spirit if you will. We do not belong to this material world that science constructs for us. We are not in it; we are outside. We are only spectators. The reason why we believe that we are in it, that we belong to the picture, is that our bodies are in the picture. Our bodies belong to it. Not only my own body, but those of my friends, also of my dog and cat and horse, and of all the other people and animals. And this is my only means of communicating with them. Schrodinger was a very spiritual man, more akin to a mystic. Albert Einstein once wrote a letter to Schrodinger, referring to his famous cat in a box thought experiment. Einstein said it “refuted most elegantly” the idea that there is an objective reality different from our own subjective experience of time. You are the only contemporary physicist, besides Laue, who sees that one cannot get around the assumption of reality — if only one is honest. Most of them simply do not see what sort of risky game they are playing with reality — reality as something independent of what is experimentally established. Their interpretation is, however, refuted most elegantly by your system of radioactive atom + amplifier + charge of gun powder + cat in a box, in which the psi-function of the system contains both the cat alive and blown to bits. Nobody really doubts that the presence or absence of the cat is something independent of the act of observation. I’d like to quote again from David Bohm’s textbook Quantum Theory. We now come to the third important modification in our fundamental concepts brought about by the quantum theory; namely, that the world cannot be analyzed correctly into distinct parts; instead, it must be regarded as an indivisible unit in which separate parts appear as valid approximations only in the classical limit. This conclusion is based on the same ideas that lead to the principle of complementarity; namely, that the properties of matter are incompletely defined and opposing potentialities that can be fully realized only in interactions with other systems. Thus at the quantum level of accuracy, an object does not have any “intrinsic” properties (for instance, wave or particle) belonging to itself alone; instead, it shares all its properties mutually and indivisibly with the systems with which it interacts. Moreover, because a given object, such as an electron, interacts at different times with different systems that bring out different potentialities, it undergoes (as we have seen in Sec 14) continual transformation between the various forms (for instance, wave or particle form) in which it can manifest itself. …it can be seen that as we try to improve the level of accuracy of description, the classical program of analysis into parts eventually becomes infeasible. The program of synthesis according to causal laws also becomes infeasible, since there are no exact causal laws. We are led, instead, to a new point of view, based on the idea that the quanta connecting object and environment constitute irreducible links that belong, at all times, as much to one part as to the other. Since the behavior of each part depends as much on these quanta as on its “own” properties, it is clear that no part of the system can be thought of as separate. If, in a classical experiment, we discovered the presence of irreducible “links” between objects, we should then postulate a third object, the link, and thus re-establish the old type of description, this time in terms of three parts to the system. In quantum theory, however, these quanta do not constitute separate objects, but are only a way of talking about indivisible transitions of the objects already in existence. The fact that quanta are unpredictable and uncontrollable would, in any case, prevent their introduction as a third object from being of any use, since we could not in any definite way ascribe observed effects to them. The fact that quantum systems cannot be regarded as made up of separate parts working together according to causal laws means that we are now led to a fundamental change in our general methods of description of nature. Only in the classical limit, where the effects of individual quanta are negligible and where their combined effects can be approximated by a causal description, is it possible to separate the world into distinct parts. Even in the classical limit, we recognize that the separation between object and environment is an abstraction. But because each part interacts with the other according to causal laws, we can still give a correct description in this way. In a system whose behavior depends critically on the transfers of a few quanta, however, the separation of the world into parts is a non-permissible abstraction because the very nature of the parts (for instance, wave or particle) depends on factors that cannot be ascribed uniquely to either part, and are not even subject to complete control or prediction. Thus, by investigating the applicability of the usual classical criteria for analyzing a system into distinct parts, we have been led to the same conclusion as that obtained directly in Chap. 6, Sec. 13: The entire universe must, on a very accurate level, be regarded as a single indivisible unit in which separate parts appear as idealizations permissible only on a classical level of accuracy of description. This means that the view of the world as being analogous to a huge machine, the predominant view from the sixteenth to nineteenth centuries, is now shown to be only approximately correct. The underlying structure of matter, however, is not mechanical. The past few weeks I’ve been reading a textbook written by David Bohm called Quantum Theory, an advanced undergraduate textbook he developed for his students at Princeton in the 1950s. 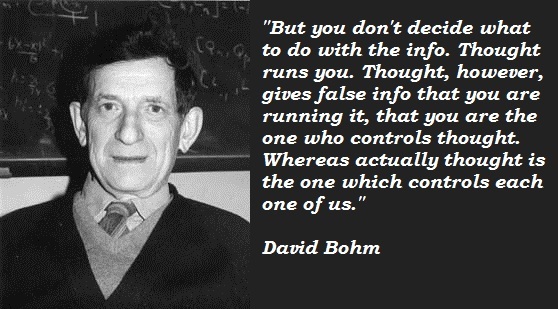 If you don’t know about David Bohm, he was a theoretical physicist who taught at Princeton and the University of London. As a colleague and good friend of Albert Einstein, they worked together in developing quantum physics. What I particularly enjoy is its philosophical speculations and ideas, such as this passage on how quantum mechanics relates to thought. He believed that quantum effects within the brain were directly related to consciousness. It seems that Niels Bohr entertained similar ideas as the textbook mentions discussions they had together. Bohm argues that there are strong similarities between our thought processes and how matter behaves at small scales, tying together these ideas with the uncertainty principle. There are wide ranges of experiences in which occur phenomena possessing striking resemblances to quantum phenomena. These analogies will now be discussed, since they clarify the results of the quantum theory. Some interesting speculations on the underlying reasons for the existence of such analogies will also be introduced. If a person tries to observe what he is thinking about at the very moment that he is reflecting on a particular subject, it is generally agreed that he introduces unpredictable and uncontrollable changes in the way his thoughts proceed thereafter. Why this happens is not definitely known at present, but some plausible explanations will be suggested later. If we compare (1) the instantaneous state of a thought with the position of a particle and (2) the general direction of change of that thought with the particle’s momentum, we have a strong analogy. We must remember, however, that a person can always describe approximately what he is thinking about without introducing significant disturbances to his train of thought. But as he tries to make the description precise, he discovers that either the subject of his thoughts, or their trend, or sometimes both become very different from what they were before he tried to observe them. Thus, the actions involved in making any single aspect of the thought process definite appear to introduce unpredictable and uncontrollable changes in other equally significant aspects. A further development of this analogy is that the significance of thought processes appears to have indivisibility of a sort. Thus, if a person attempts to apply his thinking more and more precisely defined elements, he eventually reaches a stage where further analysis cannot even be given a meaning. Part of the significance of each element of a thought process appears, therefore, to originate in its indivisible and incompletely controllable connections with other elements. Similarly, some of the characteristic properties of a quantum system (for instance, wave or particle nature) depend on indivisible and incompletely controllable quantum connections with surrounding objects. Thus, thought processes and quantum systems are analogous in that they cannot be analyzed too much in terms of distinct elements, because the “intrinsic” nature of each element is not a property existing separately from and independently of other elements but is, instead, a property that arises partially from its relation with other elements. In both cases, an analysis into distinct elements is correct only if it is so approximate that no significant alteration of the various indivisible connected parts would result from it. There is also a similarity between the thought process and the classical limit of the quantum theory. The logical process corresponds to the most general type of thought process as the classical limit corresponds to the most general quantum process. In the logical process, we deal with classifications. These classifications are conceived as being completely separate but related by the rules of logic, which may be regarded as the analogue of the causal laws of classical physics. In any thought process, the component ideas are not separate but flow steadily and indivisibly. An attempt to analyze them into separate parts destroys or changes their meanings. Yet there are certain types of concepts, among which are those involving the classification of objects, in which we can, without producing any essential changes, neglect the indivisible and incompletely controllable connection with other ideas. Instead, the connection can be regarded as causal and following the rules of logic. Logically definable concepts play the same fundamental role in abstract and precise thinking as do separable objects and phenomena in our customary description of the world. Without the development of logical thinking, we would have no clear way to express the results of our thinking, and no way to check its validity. Thus, just as life as we know it would be impossible if quantum theory did not have its present classical limit, thought as we know it would be impossible unless we could express its results in logical terms. For instance, many people have noted that a new idea often comes suddenly, after a long and unsuccessful search and without any apparent direct cause. We suggest that if the intermediate indivisible nonlogical steps occurring in an actual thought process are ignored, and if we restrict ourselves to a logical terminology, then the production of new ideas presents a strong analogy to a quantum jump. In a similar way, the actual concept of a quantum jump seems necessary in our procedure of describing a quantum system that is actually an indivisible whole in terms of words and concepts implying that it can be analyzed into distinct parts. We may now ask whether the close analogy between quantum processes and our inner experiences and thought processes is more than a coincidence. Here we are on speculative ground; at present very little is known about the relation between our thought processes and emotions and the details of the brain’s structure and operation. Bohr suggests that thought involves such small amounts of energy that quantum-theoretical limitations play an essential role in determining its character. There is no question that observations show that the presence of an enormous amount of mechanism in the brain, and that much of this mechanism must probably be regarded as operating on a classically describable level. In fact, the nerve connections found thus far suggest combinations of telephone exchanges and calculating machines for complexity that has probably never been dreamed of before. In addition to such a classically describable mechanism that seems to act like a general system of communications, Bohr’s suggestion involves the idea that certain key points controlling this mechanism (which are, in turn, affected by the actions of this mechanism) are so sensitive and delicately balanced that they must be described in an essentially quantum-mechanical way. (We might, for example, imagine that such key points exist at certain types of nerve junctions.) It cannot be stated too strongly that we are now on exceedingly speculative grounds. Bohr’s hypothesis is not, however, in disagreement with anything that is now known. And the remarkable point-by-point analogy between the thought processes and quantum processes would suggest that a hypothesis relating these two may well turn out to be fruitful. If such a hypothesis could ever be verified, it would explain in a natural way a great many features of our thinking. In the absence of any experimental data on this question, the analogy between thought and quantum processes can still be helpful in giving us a better “feeling” for quantum theory. For instance, suppose that we ask for a detailed description of how an electron is moving in a hydrogen atom when it is in a definite energy level. We can say that this is analogous to asking for a detailed description of what we are thinking about while we are reflecting on some definite subject. As soon as we begin to give this detailed description, we are no longer thinking about the subject in question, but are instead thinking about giving a detailed description. In a similar way, when the electron is moving with a definite trajectory, it simply can no longer be an electron that has a definite energy. If it should be true that the thought processes depend critically on quantum-mechanical elements in the brain, then we could say that thought processes provide the same kind of direct experience of effects of quantum theory that muscular forces provide for classical theory. Thus, for example, the pre-Galilean concepts of force, obtained from immediate experience with muscular forces, were correct, in general. But these concepts were wrong, in detail, because they suggested that the velocity, rather than the acceleration, was proportional to the force. (This idea is substantially correct, when there is a great detail of friction, as is usually the case in common experience.) We suggest that, similarly, the behavior of our thought processes may perhaps reflect in an indirect way some of the quantum-mechanical aspects of the matter of which we are composed. The other night I mentioned a dream I recently had. In the dream I went through a process of disconnection from the “bubble” world I was living in, veering off the main “path” and finding that I lived in a much more majestic and wonderful universe than I had imagined. In the dream I became frustrated and the world pushed me off into a new direction where there were beautiful plains, crystal clear waters, and all sorts of strange creatures who lived in beautiful pristine environments. Words can’t really do it justice, but Sir David Attenborough has a way of accomplishing this. Take a look at this clip and you’ll see some of the creatures I was dreaming of. How do you put into words those brilliant blues as he was scuba diving in the depths underneath the ice? How do you capture the elegance of that snow owl swooping down through the trees? Or what about those little sea horses? It’s not just our world to think about. There are countless worlds, all spiraling about one another in a panoramic firework display. That is reality. There are so many galaxies, you could never begin to count them. It may well literally go on forever. Cosmological theories such as cosmic inflation predict that this may just be one of many universes popping out of nothing. And those crazy black holes I posted in the video just yesterday? There are theories that those are new big bang bangs, creating new universes. – Physicist Lee Smolin, Do Black Holes Create New Universes? To think that all this just burst into existence. From where? From what? How? Maybe it’s an eternal process of creation and destruction? Or was there a creator? Just think of the immensity of space and time. Think of all that’s out there. There’s probably all kinds of life all over this cosmos, much of it far more advanced than we’ll be for quite some time. Think of life-forms where their technology and society has been advancing for billions of years. They’d be like gods. I bet they’re immortal, profoundly wise, and so powerful we couldn’t distinguish them from gods. I have little doubt that beings like that exist all over the cosmos, of all shapes and varieties. I find myself wondering what beings like that do with themselves. What are they building? What are they thinking about? I’m sure I could never understand it. Why is all of this here? Why are you here? What is all of this? Why are we conscious of any of it? What are things made of? How did it get here? Why is it here? What are we? Have things always been this way? How do we relate to this bigger picture? Or is there a bigger picture? Does this universe go on forever? Did it have a beginning? Will it end? Is there something beyond death? What is life? What is consciousness? Open yourself to all of this. Think deeply about it. Connect with the universe because that’s what we are. Once you feel and understand that, just quietly contemplate the process that created you. Reflect on it. You’ll realize it’s beyond most categories of thought, emotion, or understanding. I find that deeply satisfying. If this place is truly infinite in all directions, as I believe it is, there is no center. Everywhere is the center. If the universe is an infinite mural that goes on and on with new and novel things in every direction, small or large, this way or that way, you’re always at the center. There’s no need to rush off thinking that someplace else is where the real action is going on. It’s happening all around us. The world is built in a way in which its secrets are visible in everything, small or large. Since we’re here, let’s take a close look at this place and enjoy the experience. Look closely at what is, right here from our human vantage point, and just admire it. There’s no need to rush. Get off the super-highway. It doesn’t go anywhere. 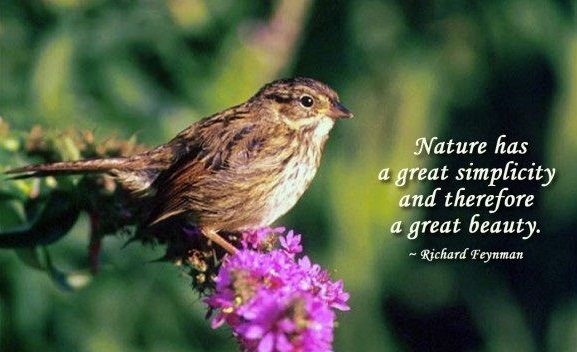 I guess what I’m trying to say is we should tap into nature’s imagination, which is far beyond ours. Look, listen, and learn. Melodysheep produced another Symphony of Science video, this time on black holes! Earlier today, I was browsing videos on Closer To Truth, one of my favorite websites. The neuroscientist Dr. Robert Lawrence Kuhn interviews top intellectuals from the fields of physics, technology, philosophy, neuroscience, theology, and other disciplines, asking them about the nature of consciousness, the cosmos, God, and all sorts of interesting things. I was watching videos related to sleep in the consciousness section and was reminded of a nice dream I had the other night. A powerful thought kept flowing through my mind, “This highway leads to success!” If I could just stay on that road, I’d be set! I wasn’t where I wanted to be, but that was all temporary. I was on my way. How glorious it would be once I made it to my destination. Where was that exactly? I didn’t know, but that highway led there. I just knew it. Before too long I came across a small team of police officers and road blocks. It was a detour. They were forcing me to get off the main highway and I didn’t want to. I argued with them and even held up traffic, telling them that I had to get through, but they wouldn’t let me. So I had no choice but to turn down the gravel side-road. And wouldn’t you know it, I was soon lost. 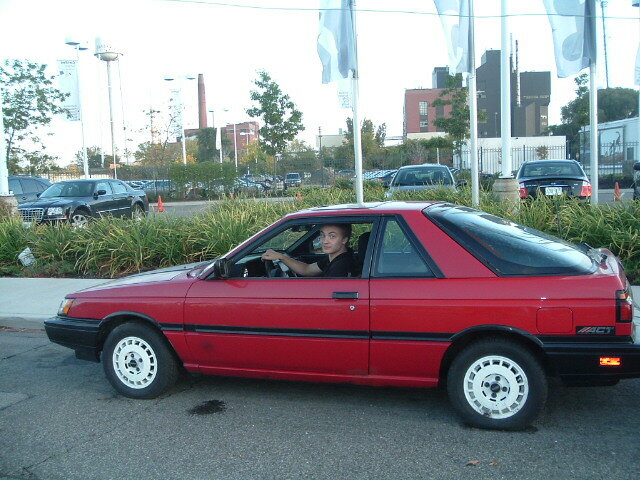 To make matters worse, the old Sentra broke down and I was stuck on foot. As I was walking down the old country roads, out in the middle of who knows where, I started seeing “visions” of all my regrets. It was almost like the air had magical properties, drawing out nasty experiences and bursting them into flashes of light which would paint a scene in the sky, forcing you to remember things you’d rather forget. I kept walking down these roads for what seemed an eternity, lost, watching these terrible experiences from my past. I was first back in high school and I watched a girl I liked get with some other guy and I had to sit there listening to her tell me how much she liked him. Then I remembered watching my Uncle Layton die, then my grandmother die. I saw myself at their graves and their funerals. I relived my entrepreneurial days, working 12 hour days, much of it never amounting to much. I regretted missing out on experiences I could have had — instead I was just working. I remembered watching my old friends struggle in life and there was nothing I could do to help. As I wandered these backroads, I ran into all kinds of people, all of them miserable. They were all unhappy, depressed, and unable to find the strength to do something with themselves. They had no motivation to even get up to greet me, most of them staring blankly off into the distance, lost in these back roads. I had compassion for them, but nothing I said or did helped. Eventually I told them I was going to keep pressing forward, trying to find a way back to the super-highway. They weakly cheered me on and I asked if anyone would come with me. None of them would. Eventually I got tired of those country roads. I couldn’t stand seeing those “visions” of regret and I yelled out that I didn’t want to see them anymore. They kept coming so I said to myself, “Screw these roads. I’ll cut through the woods and fields.” By that point I was really lost. I kept wandering through open plains, crossing rivers, and cutting through dense forest. With time I came to beautiful open pastures with flowing rivers and crystal clear waters. There were deer grazing, flowers in bloom, and a nice breeze. I said to myself, “Now this is nice!” There were even people there but they were different. They were scientists and philosophers, thinking people, and they wandered around these places, studying and recording everything they found. They’d tell me, “There are strange creatures living over here. Come with us!” Another would lead me deep into these caverns and we explored their depths, admiring the glow-worms. I told one of them, “It’s like a starry sky.” Then he told me, “It IS a starry sky!” We were actually near the entrance of the cave again and there was a large opening to the sky, a glowing Milky Way. I found that I really enjoyed the time I spent with those guys. They were engaged with the world and had a child-like curiosity for the mysteries of life. After some ten odd years, I had completely forgotten about the super-highway. I was completely happy wandering those beautiful plains with my fellow scientists. One day I set out on an expedition to chart a distant set of hills and found a new path. It was strange because we hadn’t charted this area yet. Somebody must be nearby, so I followed it. It went for a ways, winding about the hills, through the trees, and eventually popped out in a surprising place — the super-highway! I rubbed my unshaved, bristly chin, thinking, “My my my. It can’t be! ?” Nobody was anywhere to be found. I saw the road-blocks which by this time were worn down by the weather. I gently pushed them aside and made my way down this mega roadway. 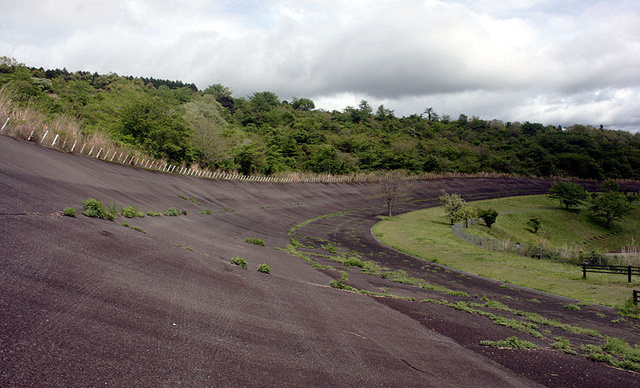 It was huge, featuring curved banks for high speed travel, just like a Nascar race track, but it hadn’t been tended to for quite some time. It was really something, even grander than I originally remembered. I walked a short ways, probably less than a quarter mile, and then I came to a short hill. As I got to the top I realized that the pavement abruptly ended, crumbling due to erosion, and there was a row of trees in the distance. It just, ended. 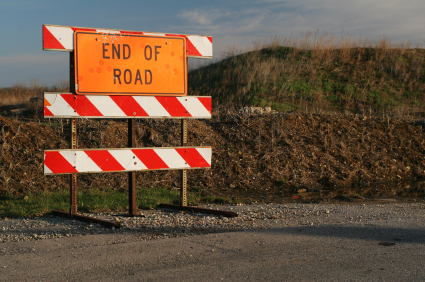 I burst into laughter, threw my hands in the air and yelled out, “There is no road!” I couldn’t stop laughing! I could hardly contain myself. All that excitement woke me up and I felt so good inside. Such peace. For several days this dream was all I could think about. At first I felt it meant that I was never on a detour, that I was always on the main road. All of those things that happened were just a catalyst to prod me to find the beautiful fields. Then I thought that it may have a deeper meaning as well. That location with the roadblocks represented “now”. The eternal now. In the beginning I was so busy trying to get someplace else, I just couldn’t enjoy the present. That caused me to go on the detour and suffer, a sort of purification process. Then after the long detour loop, I ended up exactly where I started, but unlike before, I wasn’t in a hurry to get anywhere. That’s when I was ready to see the “truth”. There may not be a highway, but I didn’t feel scammed, or angry, or let down. I just laughed. I could now see the world in a grain of sand or a blade of grass. I always had what I needed, I just didn’t realize it. It really was a wonderful dream.